Back to work today, and I made sure to get there extra early in case the roads were worse than we predicted. The only problem was, I forgot to make egg muffins last night, so I just grabbed a Larabar and had that once I got to the office. It was definitely not enough protein to last me all morning! By the time lunch came, I was starving. Most of my students made it to class today, which was good. We had a lot of material to cover! After work, I read to Noah and snuggled him a lot. I didn't really get a lot of sleep last night because I was so nervous about getting into an accident on the way to work that I couldn't sleep. All I could think about all day at work was how bad I wanted to get home and spend time with my baby! I made dinner for Matt and Noah, then headed to the gym for 40 minutes on the stationery bike. I really wasn't feeling it tonight - I definitely got a cold some time yesterday and am feeling stuffy and all-around yuck. I found some Seinfeld reruns and that made the time go pretty quickly. I had my plate of dinner after I got home. 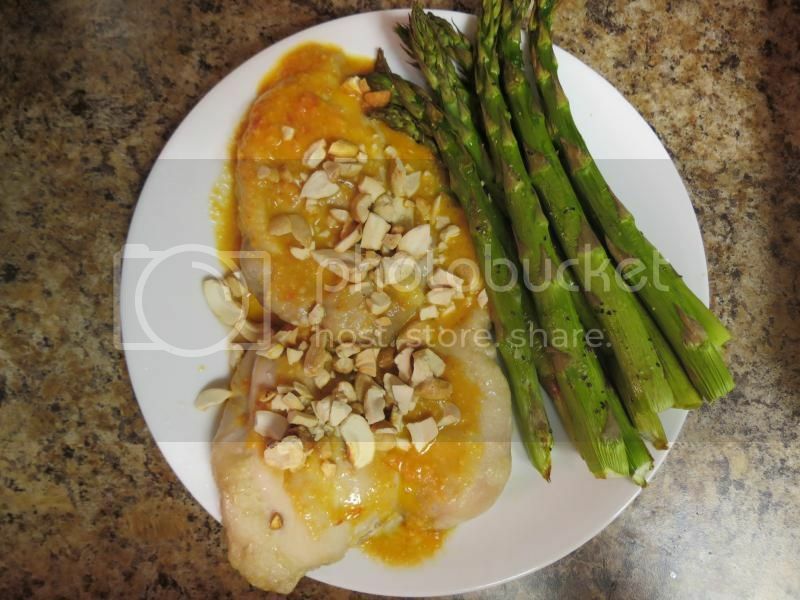 I had made roasted asparagus and this cashew chicken recipe that I found on Pinterest. OH MY GOODNESS. It was SO good! Like, tasted just like a plate of real Thai food. My sauce came out a bit thinner than the one in the picture on the Pin, but the taste was so good, it didn't matter. This plate was Matt's - I usually cook up four pieces of chicken and give two to Matt, have one myself, and save the last one for Matt's lunch the next day. With the exception of today's quick breakfast, I'm finding that I am feeling more satisfied with my meals these days. It's a good feeling, to not be so hungry or feel so deprived that food is constantly on my mind. I almost had a slip-up today. I made sweet potato for Noah for dinner and added some black beans, and out of habit, I went to taste it before I gave it to him. I realized, though, and stopped myself. Something the Whole 30 is making me very aware of is how much tasting and sampling I did before we started. Eat a Cheerio as I give one to Noah, try a bite of his teething cookie before I let him have it. It's a cookie, it's got to taste just fine. No need for me to sample it. It's little bites here and there, but it certainly adds up. Random: My friend uses this - http://www.bedbathandbeyond.com/store/product/Gefu-Spirelli-reg-Spiral-Slicer/1041723715?Keyword=spiral+slicer - to make noodles out of zucchini. Have you tried that? I can't find if you've ever posted about it, but I seem to think you have (or maybe I'm thinking of the post about slaw).